Without faith it is impossible to please God (Heb. 11:6). Faith is our victory that overcomes the world (1 John 5:4). Faith is essential to everything we do in the Christian life. Yet many Christians still struggle with faith. It seems to be an elusive concept to many, and even those who have walked in faith have trouble maintaining that faith walk. Is it really that hard? Not if you understand a few basics. Second Peter 1:3 says that everything we need for godliness (including faith) comes through the knowledge of God. In other words, faith is based on knowledge. 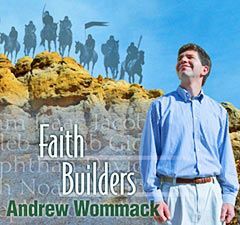 In this album, Andrew shares foundational faith-truths that the Lord has revealed to him. No one understands everything about faith, but his faith has produced miraculous results. He has seen blind eyes open, the deaf hear, and more than one person raised from the dead. These truths brought Andrew to this level of victory, and they will do the same for you. Faith is not pretending something is so, when it really isn't, until it becomes so. Faith is real! There is an unseen world with spiritual realities that already exist. Faith is simply seeing what is real in the unseen world and then acting accordingly. What is already true in the spirit will become manifest in the physical world. The Lord originally created us with six senses. That sixth sense, which isn't functioning in most people today, is faith. Faith can perceive unseen realities, just as our eyes and ears can perceive physical realities. We can train our five senses to acknowledge and accept that the input of faith is just as real as what we can see, taste, hear, smell, or feel. We can walk by faith and not by sight (2 Cor. 5:7). Everyone has to deal with doubt. John the Baptist doubted that Jesus was the Christ, even after he had witnessed signs from God and boldly proclaimed Jesus as the Lamb of God that takes away the sin of the world. Because Jesus respected John so much, He didn't just meet John on an emotional level and give him a temporary fix. Instead, Jesus pointed John back to the Word to fix his unbelief. As long as we are self confident, we will not be strong believers. Why? Because we think we can handle things. Any dependence on self will dilute our total trust in God's power. It's only when we put faith in what the Lord has done for us, independent of what we deserve or can do for ourselves, that we begin to experience the consistent victory that faith can produce.